ROYAL JELLY HAIR LOSS TREATMENT 150ml is specifically designed to stimulate the activity of the hair bulb, revitalizing and strengthening the hair, has a preventive action on the hair loss, by common not metabolic causes, it is a revitalize and stimulant in the propitious zones to the capillary regeneration. SIMONE TRICHOLOGY ROYAL JELLY HAIR LOSS TREATMENT 150ml is specifically designed to stimulate the activity of the hair bulb, revitalizing and strengthening the hair. In its composition, the real jelly contains saccharides, proteins and lipids in addition to an extensive group of vitamins between those who find the B1, B2, B6, B5, B8, AND, PP, FOLIC ACID, albumens, and amino acids (ARGININE, VALINE, LYSINE, METHIONINE, PROLINE, SERINE, GLYCINE, ETC.). Minerals such as IRON, GOLD, CALCIUM, COBALT, SILICON, MAGNESIUM, MANGANESE, NICKEL, SILVER, SULFUR, CHROMIUM AND ZINC, are also part of royal jelly. SIMONE TRICHOLOGY ROYAL JELLY HAIR LOSS TREATMENT 150ml has a preventive action on the hair loss, by common not metabolic causes, it is a revitalize and stimulant in the propitious zones to the capillary regeneration. By means of the trichogens (tricho peptides), SIMONE TRICHOLOGY ROYAL JELLY HAIR LOSS TREATMENT 150ml acts over the hair bulb improving the activity of the same one. 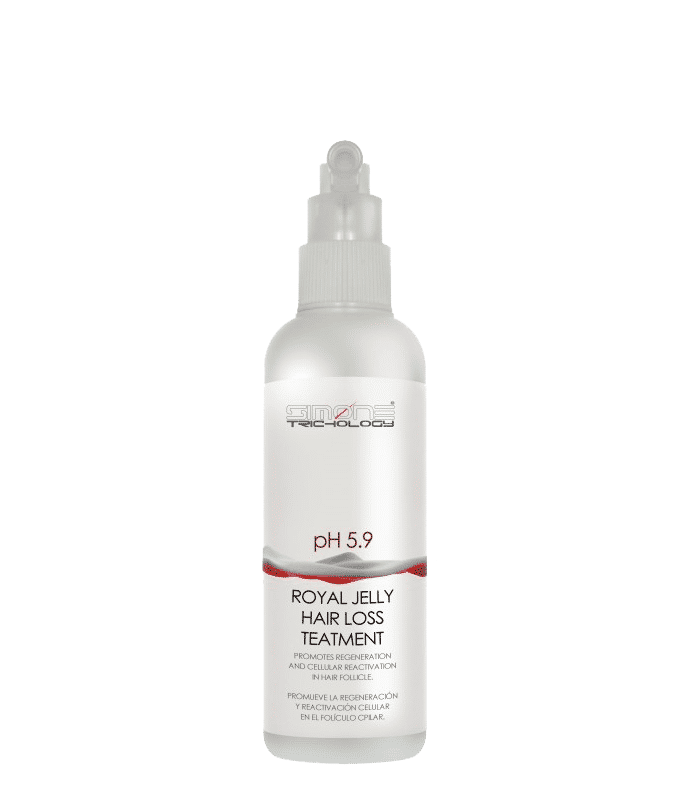 Apply SIMONE TRICHOLOGY ROYAL JELLY HAIR LOSS TREATMENT 150ml twice a day on the scalp and hair clean, massage in a circle using fingers, then extend into the tips of the hair. the treatment can be used on either wet or dry hair.